This chapter discusses the roles of seed-vectored microbes in modulating seedling development and increasing fitness of plants in terms of increased biotic and abiotic stress tolerance. Particular emphasis is placed on microbes that function in the rhizophagy cycle. These microbes have been shown to enter into root cells and stimulate root growth. In some cases microbe entry into root cells results in root growth repression. The term ‘endobiome interference’ has been applied to the phenomenon of plant growth repression due to intracellular microbes. 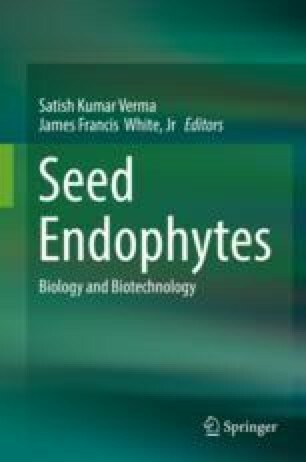 The potential application of endobiome interference to produce bioherbicides that selectively enhance growth of target crops but inhibit competitor weeds is discussed. The authors acknowledge the Department of Plant Biology, Rutgers University, NJ, for research facilities and financial support. SKV is thankful to UGC, India, for providing a Raman Post Doctoral fellowship (No.-F 5-11/2016 IC) for the year 2016–2017 to conduct research in the USA. SKV is grateful to the Head and Coordinator CAS, FIST of Botany, B.H.U., Varanasi, India, for providing the leave to pursue research on endophytes. The authors are also grateful for support from USDA-NIFA Multistate Project W3147 and the New Jersey Agricultural Experiment Station. Funds for much of this work were from Cooperative Ecosystems Studies Unit CESU G16AC00433 between Rutgers University and the US Geological Survey for control of invasive Phragmites australis. Any use of trade, firm, or product names is for descriptive purposes only and does not imply endorsement by the US Government.